Jared Sullinger: "I don't know why people keep talking about tanking." Jared Sullinger probably wouldn’t mind having Andrew Wiggins or Jabari Parker as a teammate next season. He just isn’t playing that goal in mind. Sullinger and the Celtics ended November with a 7-12 record, which won’t remind anyone of the 1995-96 Chicago Bulls but wonât remind anyone of the 1972-73 Philadelphia 76ers, either. The fact that the Celtics have been this competitive is a surprise to some observers and a disappointment to some fans, who would rather see the Celtics lose as many games as possible to "tank" for a top draft pick and a chance to get Wiggins or Parker. Sullinger has a message for the pro-tanking crowd, though, and it’s not friendly. 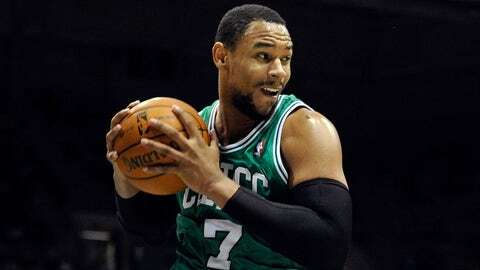 "A lot of guys expect us to tank for Parker or Wiggins," Sullinger told reporters after practice Monday. "Y’all might as well throw that out the door. I don’t know why people keep talking about tanking. We have competitors out here. We’re really not like that. We don’t care if [Jeff] Green averages 20 or I average eight. We just want to win and show everybody that y’all can kiss our butts about the tanking stuff." Tankers are going to hate this next bit of info: In the atrocious Atlantic Division, which the Toronto Raptors lead with a record of 6-10, the Celtics are only a half-game out of a top-four seed in the Eastern Conference, due to the rule that division winners are guaranteed one of the first four seeds in each conference. Even if the Raptors keep winning (or, more accurately, keep losing slightly less often than the rest of their division), the Celtics can move within a game in the loss column of eighth-place Detroit on Tuesday with a win over the Bucks and a Pistons loss to the Heat.